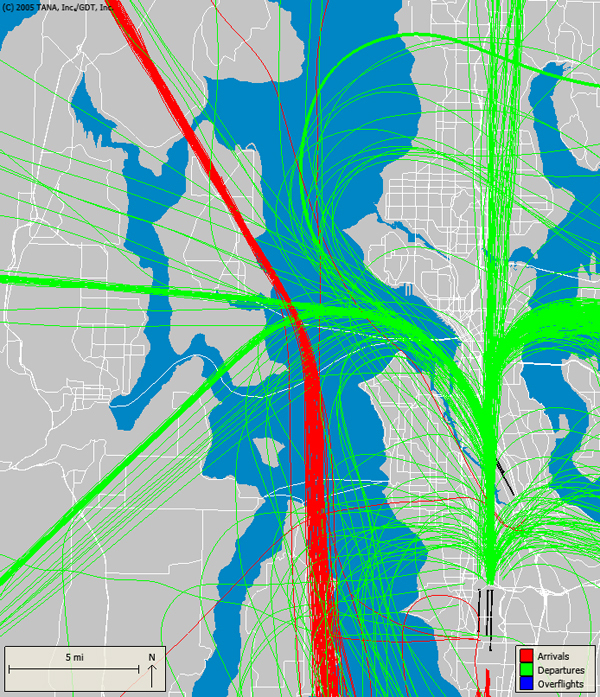 There are a few nifty websites for tracking flights in real time. The top image is from FlightAware. The bottom image is from WebTrak. Even if you don’t have a problem with airplane noise, it’s still interesting to know what’s going on in the air above the island and peninsula. 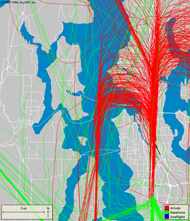 Sea-Tac provided us with flight tracks from typical north flow and south flow days for the original story. They showed how planes are routed heavily over the island on north flow days (typically clear summer days), while planes are routed away from the island on south flow days (overcast days). 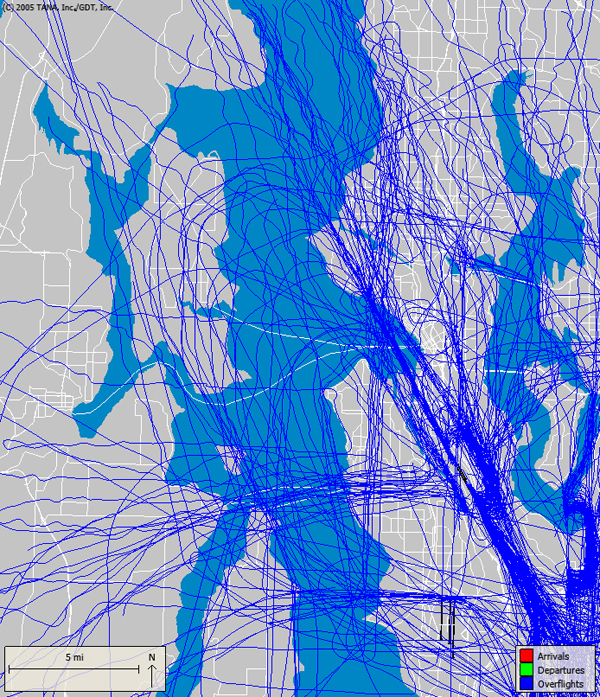 Officials also sent Bainbridge Island City Manager Doug Schulze graphics comparing flight tracks over the last few years. Schulze was kind enough to pass those charts along. Full sized versions of these graphics can be viewed here, here and here. 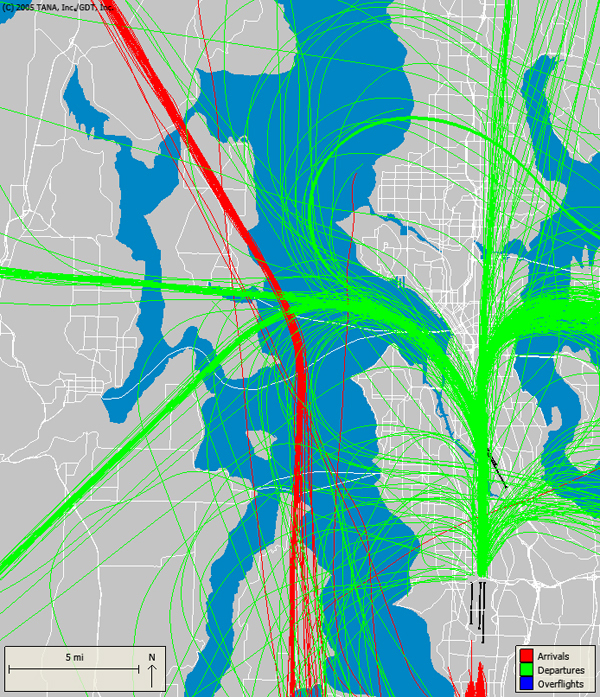 Much of this traffic originated from King County International Airport (Boeing Field), as well as the sea plane base in Renton. These include many small planes and cargo planes. 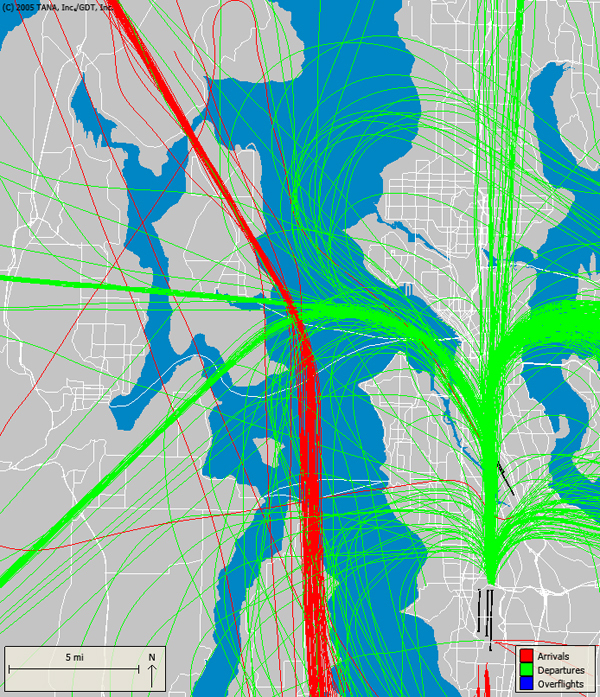 A number of commenters alluded to route changes taking place due to the Greener Skies initiative, which aims to reduce emissions and noise in the Seattle area. I’m waiting for more information on this, but from what I understand the project is being implemented in phases with only a few airlines participating thus far. Feel free to drop me a comment below or email me at tad.sooter@gmail.com. This article is very interesting for we have experienced low flying commercial airlines over our home near Meadowmeer. They come over as early as 4:30 am and then later in the afternoon. The Gods Must Be Crazy for one of these airlines left me a gift of a pair of channel lock pliers. They fell off the plan and lodged into the back yard about an inch into the ground. Mind you, if this was a piece of ice the FAA would be on it in a heartbeat. However, I never received a reply from the FAA in Renton when I emailed them to ask where they wanted the pliers to be sent. One would think that they would at least be curious as to why this strange email was sent to them? This is very interesting and I am glad someone published it. I have been having similar frustrations with the low flying aircrafts. The other night a plane flew VERY close to my house and shook the windows and scared the heck out of me. And the frequency has increase substantially over the years. Its not only commercial flights but its personal aircrafts and helicopters. And to the person saying that it is just Bainbridge islanders tring to get their way… you’re wrong. I live in Kingston and have this same problem. Make it stop!!! I, too, have been hearing more aircraft flying over, in the past year. They are lower, and fly late at night, as well. So, for people to say that Bainbridge is the only one complaining, I disagree….I am right there with them on this one, and I am near Jackson Park, for over 13 years. I recall one, in particular, that woke me UP, and I thought, oh no, we are going to war. I wouldn’t want to listen to air traffic all day and night long, but I love it when a huge, low flying aircraft rattles my windows. Nothing better than seeing an old B-17 or a 747 skipping across my horizon. Except maybe seeing the Blue Angles streak over at about 500′!